Surrounded by his family at Whisperwood Villa on April 6, 2010, of Mr. A. Francis (Frank) MacDonald in his 85th year. Beloved husband of Phyllis (nee Hughes). Father of Paula (Frank Likely), Mark (Dr. Joanne MacDonald), Austin (Kathleen Andrews), Leah (Gary Kilbride) and Lorena. Grandfather of Jason, Dara, David, Charlotte, Hannah, Stephen and Zachary. Predeceased by his parents, May and Charlie MacDonald; and his brothers, Bill and Howard. He was born at the Charlottetown Hospital on the day of its official opening, was educated at Queen Square School and St. Dunstan's College, served in the Royal Canadian Navy during the Second World War and worked for CN for 39 years. 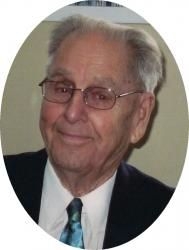 He was an active and generous community and church volunteer, a life long member of the Royal Canadian Legion and the Knights of Columbus and served as Village Commissioner and Chairman of the Parkdale Village Commission in the village's early years. Resting at the Hennessey Funeral Home until 12:45 on Friday afternoon, then transferred to St. Pius X Church, Charlottetown, for funeral mass at 1 p.m. Interment will take place later in the Roman Catholic Cemetery, Charlottetown. Visiting hours will be held on Thursday 2 to 4 and 7 to 9 p.m. In Frank's memory, donations may be made to the charity of your choice. St. Pius X Council 6917 of the Knights of Columbus will hold a prayer service at the funeral home on Thursday at 6:30 p.m.
Charlottetown Branch #1 of the Royal Canadian Legion will hold a veterans tribute service at the funeral home on Thursday at 6:45 p.m.
At Whisperwood Villa on Wednesday, October 16, 2013 of Arnold Richard MacDonald formerly of Long Creek. Arnold was born on October 24, 1911. Beloved husband of Norma (nee Currie). Dear father of Donna Herlihy, David (Donna Carmody) and Carol Gass (Dannie). Loving grandfather of Angela Stewart (Kirk), Ryan Herlihy (Judy), Wayde MacDonald (Angela), Lori Ann Dowling, Ambyr MacDonald (Daryl Ashby), Nathan MacDonald (Dawn Marie), Tim Gass (Sandra Dennis), Jamie Gass, by 13 great-grandchildren and 2 great-great grandchildren. Brother-in-law of Vera Campbell and Wilma MacDonald. Predeceased by his first wife Jessie (Campbell) and by his brothers and sisters Sarah MacDougall, Martin, Charles, Adelbert, George, Albert, Lemuel, Mary Margaret Smith, and Arthur. Resting at Belvedere Funeral Home from where the funeral service will be held in the funeral home chapel on Saturday at 1pm. Interment in Burnside Presbyterian Church Cemetery, Clyde River. Visitation on Friday 4-8 pm. Family Flowers only. Memorial donations may be made to Burnside Presbyterian Church Cemetery, Clyde River. Kingston Branch #30 of the Royal Canadian Legion will hold a service at the funeral home on Friday at 3:30 pm. The death occurred at the QueenElizabethHospital on Saturday, November 24, 2012 of Mr. Gordon J. “Buddy” MacDonald of Charlottetown, age 85 years. Left to Mourn are his children Donna White (Emmett), Sharon Moores (Ed), Darlene MacDonald, Marel McKay (Shaun), Gordie (Candace), Deanna Bowtle (Steve), Sylvanus Joseph “Syl”-deceased and their mother Margaret Shields (Reg). He is also survived by his brothers Billy (Marylou) and Syl (Sandra-deceased); sisters, Elsie MacDonald, Ruth Brown and Sheila Guay (Mike); many grandchildren, great grandchildren, nieces and nephews. He was predeceased by his parents Hubert “Alec” and Alice “Bessie” MacDonald; brother, John E. “Johnny” (Bernice); sisters, Elizabeth “Betty”, Helen “Daisy”, Gertrude “Gerty”, Edna, Edie, Dorothy and Catherine “Kay”. Resting at the Hennessey Cutcliffe Charlottetown Funeral Home for visitation on Monday 6 - 8 p.m. then transferred to Dingwell Funeral Home, Souris for visitation on Tuesday 9:30 - 10:30 a.m. The funeral mass will be held on Tuesday at St. Mary’s Church, Souris at 11 a.m. Interment to follow in the Parish Cemetery. If so desired, memorial contributions in Buddy’s memory may be made to the P.E.I. Lung Association, Queen Elizabeth Hospital Foundation or the charity of your choice. Branch #1 of the Royal Canadian Legion will hold a Veteran's Tribute Service at the funeral home on Monday evening at 5:45 p.m. Suddenly at Andrew’s of Stratford on Wednesday, February 23, 2011 of Hector Seaver MacDonald of Stratford and formerly of Summerside, aged 85 years. Father of John “Jack” (Ann), of Summerside and Scott (Joyce Gregory) of Charlottetown. Grandfather of Mitch, Christina, Davey, Daniel and Andrew. Brother of Elizabeth “Ippie” MacDonald of Kamloops, B.C. Predeceased by brothers Burt, Lester and Edwin. Special uncle of Barry and Roberta MacDonald (Sean Hennessey). Resting at Belvedere Funeral Home from where the service will be held in the funeral home chapel on Friday at 3:30 p.m. Interment later in Wood Islands Cemetery. Memorial donations may be made to Wood Islands Cemetery or Heart and Stroke Foundation. Visitation Thursday 3- 5 p.m. Branch No 1 of the Royal Canadian Legion will hold a service of remembrance from the funeral home on Thursday at 5 pm. Royal Canadian Legion Branch #1 Charlottetown will conduct a Veteran's Tribute Service at the Belvedere Funeral Home at 5PM on Thursday 24 February 2011. Peacefully at Beach Grove Home on Friday, February 19, 2010 of Mr. Howard G. Macdonald (Grandnephew of A.A. Macdonald - Father of Confederation) of Charlottetown age 87 years. Beloved husband of Phyllis (nee Gaudet) Macdonald and dear father of Michael Macdonald and Sandra Macdonald (Ernest). He is also survived by his sisters, Kathleen Shouldice and Connie Macdonald; brothers and sisters-in-law Fred & Connie Clair and Bill & Lola Gaudet; two special nieces, Sally Taylor and Colleen Clair; numerous nieces and nephews. He was predeceased by his parents Bessie (nee MacPhee) & Allistair Macdonald; brothers and sisters, Colin, John, Temple, Hugh, Agnes, Aletha, Grace, Sr. Dorothy, CSM, Jean, Helen and brother-in-law Jack Gaudet. Resting at the Hennessey Funeral Home until Wednesday morning, February 24, 2010 then transferred to the Church of the Most Holy Redeemer for funeral mass at 10 a.m. Interment later in the family plot in St. James Parish Cemetery, Georgetown. If so desired, memorial contributions may be made to the Heart & Stroke Foundation of P.E.I. or Beach Grove Home. Visiting hours at the funeral home on Tuesday 2 - 4 & 7 - 9 p.m.
the Hennessey Funeral home at 6:45PM on Tuesday 23 February 2010. On-line condolences may be made at www.islandowned.ca. At the Queen Elizabeth Hospital on Friday, March 20, 2009 of P.J. (Alden) MacDonald of Charlottetown, age 86 years. Dear father of Thomas (Kathleen), Muriel Davis (Johnny), William “Billy” (Sharon) and Cathy MacDonald. Loving grandfather of Tommy Joe MacDonald Jr., Carol Anne MacDonald, David Mark MacDonald (Tammy), Sherry Davis, Christine Spada, and Laurie Brown, and eight great-grandchildren. Brother of Gerard (Veda), and Gladys Campbell. Predeceased by his wife Doris MacDonald ( Pattengale), by his parents Thomas Joseph and Mildred (Hughes) MacDonald and by his sister Eileen Jay. Resting at Belvedere Funeral Home until Tuesday at 9:45 a.m., then to St. Dunstan’s Basilica for funeral mass at 10 a.m. Interment later in the Roman Catholic Cemetery, Charlottetown. Visiting hours Sunday 2-5 p.m. Memorial donations may be made to Canadian Cancer Society. Royal Canadian Legion Branch #1 Charlottetown will conduct a Veteran's Tribute Service at the funeral home at 1:45PM on Sunday 22 March 2009. The death occurred peacefully and surrounded by family at the Queen Elizabeth Hospital on September 24, 2009, of Stephen (Onion) MacDonald of Marshfield, veteran of the Second World War Merchant Navy, age 87 years. Beloved husband of the late Margaret (Tillie) MacDonald (nee King) and loving father of Barbara Anne, Stephen (Bucko) (Judy) and Allan (Sandra) MacDonald. Also left to mourn are his grandchildren, Ricky Pynch (Amber), Crystal MacCormac (Dwayne), Cassidy, Jamie, Matthew, Peter, Tracy, Tara and Allason MacDonald; brother, Francis and Aubrey MacDonald; sisters, Valerie and Ella MacDonald and Vaunda D'Entremont; stepchildren, Linda Robertson (Garth), Bonnie MacLean (Robert) and Gary Robbins (Lucy); and many nieces and nephews. He was predeceased by his daughter, Ellen Marie MacDonald; parents, Wallace and Jemima MacDonald; brothers, Kenneth, Wallace, Junior, Cyril and Jack MacDonald; and his stepson, Stanley Robbins. Resting at Hillsboro Funeral Home, 2 Hollis Ave., Stratford, for visitation on Sunday, September 27, 2-4 and 7-9 p.m.
Funeral mass will be celebrated on Monday, September 28, at St. Pius X Church at 10 a.m. Interment will follow at the Roman Catholic Cemetery. As an expression of sympathy, memorial donations to the Heart and Stroke Foundation or the QEH Foundation would be appreciated. The Royal Canadian Legion Charlottetown Branch #1 will hold a Veterans Tribute Service at the funeral home Sun 27 Sep 2009 at 6:25PM. The Knights of Columbus will hold a prayer service at the funeral home Sunday evening at 6:45 p.m.
Peacefully at the Queen Elizabeth Hospital on Monday, January 5, 2009, of Mr. Roland E. MacEachern (Dieppe naval veteran of Second World War) of Charlottetown, age 82 years. Loving husband of 63 years to Nina Mae (nee Younker) MacEachern. Dear father of Mike of Florida, U.S.A., and grandfather of Sean (May Leung) Stranks of London, England. Also survived by two loving great-grandchildren, Anais and Cayla; sisters, Margaret Frampton of London, Ont., and Jill (Roy) Skillicorn of Belleville, Ont. Predeceased by his parents, Angus and Helen (nee Harris) MacEachern, and brothers and sisters, Bud, Donald, Katherine, David MacEachern and Janet MacLean. Resting at the Cutcliffe Funeral Home until noon Friday, then transferred to St. Peters Cathedral for funeral service at 2 p.m. Interment later in Sherwood Cemetery. Family flowers only, memorial contributions may be made to St. Peters Cathedral Memorial Fund or the Sea Cadets. Visiting hours at the funeral home on Thursday 2–4 and 7–9 p.m.
Royal Canadian Legion Branch #1 Charlottetown will conduct a Veteran's Tribute Service at the funeral home at 6:45PM on Thursday 8 January 2009. Peacefully at the Garden Home on Thursday, May 7, 2015, the death occured of Margaret P. MacKinnon of Charlottetown, formerly of Kensington, age 90 years. Born in Clermont, P.E.I., she was a daughter of the late Neil and Pauline (nee Kelly) MacKinnon. Lovingly remembered by her nieces and nephews, Estelle (Gilbert) Egan, Linus (Bernice) Coady, Reg (Cheryl) Coady, Norma (Gerard) MacDonald, Elizabeth (Greg) Dobbin, Linda Callaghan (Tom LeBlanc), Ron (Betty) Callaghan, Patsy (George) Piercey, Norma (Terry) Walsh, Heather (Pat) Hughes and Nancy Roberts (Thomas Landry); also survived by brother-in-law, Eldon Roberts, and Libby Coady (widow of nephew, Bill Coady). Besides her parents, she was predeceased by her sisters, Ella Coady and Jean Roberts; brother, Michael MacKinnon; nephew, Bill Coady. Resting at the Hennessey Cutcliffe Charlottetown Funeral Home where the funeral service will be held on Tuesday in the funeral home chapel at 1 p.m. Interment will take place in the Roman Catholic Cemetery. Visiting hours will be held on Tuesday from 12 p.m. until time of service. Branch #1 of the Royal Canadian Legion will hold a Veteran’s Tribute Service at 12:45 p.m. If so desired, memorial contributions may be made to the P.E.I. Humane Society or a charity of choice. Online condolences may be made at www.islandowned.ca. On the beautiful morning of Monday, January 4, 2016, while fairies were dancing on the fresh new snow, our Dad was scooped up, most probably by Saint Teresa and carried off to join our mama Pearl (Roberts-Fanning), who’s heart he’s missed for the past three years. Also his Dad and Mom, Jack and May (MacKinnon), brothers and sisters Frankie, Mary (Andy) Cannon, and Marion Hazelwood, the chain will no longer be broken. Jimmy was born on September 21, 1923 in Grand Tracadie. He had an adventurous soul and spent his childhood roaming through woods and following streams. At the age of 16 he went overseas first with the P.E.I. Highlanders and then with the West Nova Scotia Regiment. Over the next 5 years he would develop some of the closest and strongest relationships of his life. He was very much looking forward to seeing those guys again. Our Jimmy was a romantic husband. He often wrote poetry and stories and brought our mom flowers and he made our lives magical. He made every fairy tale come to life, he fixed every hurt, he kissed us and hugged us and loved and taught us. He was funny and witty. He was a kind, gentle man with friends as well as family. He was first and foremost a fisherman and loved the water. He was a jack of all trades and thanks to his knack for plumbing, most of the out houses in the area were demolished by the mid sixties. He dabbled in wood working. put paint to the canvas, he was an inventor of some pretty scary but enthralling projects and a concoctor of some questionable medicinal brews from time to time. He was a teller of stories, always interesting, never boring. He witnessed the Zeppelin, Halley’s Comet and most recently Victor Clow’s Christmas display and thought they were all pretty amazing. Now he’s off on his biggest adventure yet. He’ll be having some good time. Waiting here, smiling through some tears are his children, Betty (Fanning) Watts, Carrie (Tim Banks), Roy (Brenda), Lionel (Connie McInnis), Cindy (Tony Arbing), his grandchildren and great grandchildren, in-laws, the late Clarence, Bob, the late Frank, Bev Culligan, the late George, Carl and the late Fred Roberts. Resting at the Hennessey Cutcliffe Charlottetown Funeral Home until Friday afternoon, then transferred to St. Michaels’s Church Corran Ban for funeral mass at 3:30 p.m. Visiting hours will be held on Thursday from 5:00 to 8:00 p.m. Charlottetown Branch #1 of the Royal Canadian Legion will hold a Veterans Tribute Service at the funeral home on Thursday at 4:45 p.m. If so desired memorial contributions may be made to Home Care Palliative Care or the C.N.I.B. On-line condolences may be made at www.islandowned.ca.